"Travel is true sequential art, a series of visual meditations presented in manga format. In lesser hands, this could be overly pure (read: sterile and boring) but Yokoyama is better than that. Reading Travel is like taking part in a witty conversation: It moves fast, there are lots of (visual) puns, and every time you get something, you feel smarter. It also feels an awful lot like taking a train ride. The story is simplicity itself: Three men get on a train, find a seat, ride for a while, and then get off. The manga is wordless—another boringness alert!—but don’t be dismayed. In Yokoyama’s case, each picture really is worth a thousand words, maybe two, and this is that rare comic that you can read over and over, seeing more each time. The journey unfolds in a series of small events: The travelers buy their tickets, board the train, then pass through a series of cars, each one with a whimsical theme of its own, in search of a seat. The train passes over bridges and through tunnels and alongside all sorts of intricately patterned bits of industrial and natural scenery. And yet, there is so much more than that. While the narrative is simple, the book is full of images that range from vaguely menacing to just plain odd: The three drivers of the train, in their conical hats; train stations draped in some sort of vegetation; a group of travelers all wearing some sort of uniform, including caps with an enigmatic insignia; a stranger who boards, glances around, and reaches into his jacket to produce… a book. Yokoyama doesn’t provide any more information than surface appearances, yet it’s impossible to read this book without speculating about these scenes or making connections between characters. In this way, he brings out the inner storyteller in every reader. Yokoyama’s art is energetic and kinetic. He uses strong diagonals, both within the panels and as the shapes of the panels themselves, to create a sense of dynamic motion. He also works some interesting variations on the classic example of one-point perspective, train tracks vanishing into the distance, adding interest with curves and different shapes. Stylized speedlines signal the motion of an object within a panel, varying slightly to show a door opening and the same door slamming shut. Everything is in motion, and everything moves quickly and emphatically: The traveler snatches his ticket from the machine, the doors snap open and slam shut, the three men stride purposefully through the train, gravel flies away from the wheels, raindrops streak across the windows. Motion is also implied as events unfold in sequence. Sometimes Yokoyama breaks down a single action, such as getting a drink of water from a dispenser, into a series of small panels reminiscent of an instructional diagram. Sometimes the sequence is more subtle, as when a passenger or vendor is seen from a moving point of view, and the background and profile shift as the point-of-view character moves around and past them. The scenery really flies by in the second half of the book, and Yokoyama has obviously ridden a lot of trains, because he really nails the feeling of watching the landscape speed by, especially that moment when the passenger’s gaze is focused on the middle ground and something close to the train comes along and breaks the view. Yokoyama cheats a bit on the wordless aspect by putting notes in the end of the book. Sometimes he plays the puckish artist, pointing out some obscure detail in the picture or making a deliberately abstruse comment, and that’s just annoying and pretentious. On the other hand, sometimes the note puts the whole frame into perspective or adds a bit of information about a puzzling image, such as the cigarette lighters that look like Pez dispensers to the uninformed eye. 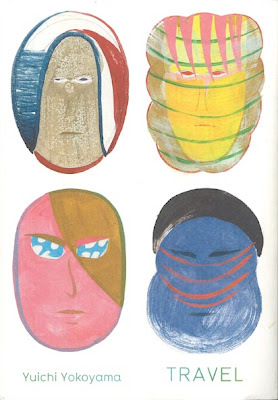 Yokoyama’s evident fascination with depicting speed and filling his panels with modern technology suggests a passing familiarity with the Italian Futurist painters, but where the Futurists dissolved their images into pure motion, Yokyoama stays resolutely concrete. The landscape goes whipping by, but the canals, water treatment ponds, and electric power lines always remains recognizable as such. "Three men take a train ride. That’s the story of Travel. Or we could say: Three man buy tickets, get on a train, find a seat, look out the window, smoke cigarettes, get off the train, and walk to the ocean. That’s probably a better description of the story. Of course, this is a Yokoyama manga, so these banal events happen in a world filled with outlandish looking characters, weird buildings, inorganic landscapes, and lots of speedlines. Sitting down requires speedlines, giving it the intensity of a fight in a more conventional manga. A fellow train passenger pulling a book from his jacket offers as much menace and tension as a gunfight. The everyday becomes exciting. Oddly, the exciting also becomes kind of banal. As I read Travel, I found my self more attracted to his depictions of the most ordinary events than to his wondrously odd buildings, landscapes, and characters. His precise lines and almost flat geometric rendering makes everything seem robotic. The imaginary world the train travels through seems so lifeless, yet the things that exist in this (our) world take on a new power and beauty when filtered through his style. It is a strange shifting of convention. Shouldn’t the attraction be the fantasy, not the everyday? These two non-consecutive pages are part of the same sequence where the bright light of the sun shines on the train, first reflecting off water, and then being blocked by trees which cast dark shadows onto the train. In both cases the pages take on a depth and beauty that is missing from most of the work. 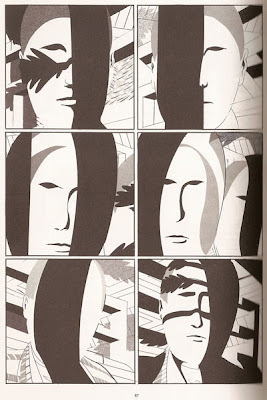 Note how the dark shadows in page 87 are shown quickly moving across the three characters faces. It’s an evocative moment that feels so powerfully real despite the weird characters and their odd landscapes. The same can be said for page 84 with the rippling shadows of the water playing off the characters and the roof of the train cabin. Both pages feature abstracted shapes and textures (the diamonds of light on 84 and the black shadows on page 87) that provide an all-over composition and rhythm to the pages. The book is worth reading for those pages alone. 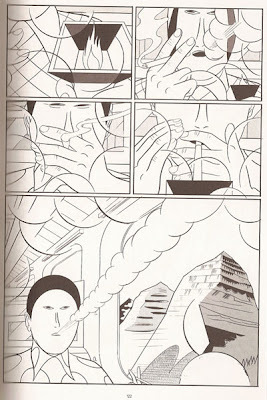 This two page sequence find two of the characters smoking on the train (now we now it’s a fantasy world). Yokoyama imbues a certain dynamism and abstract beauty into this plain action. 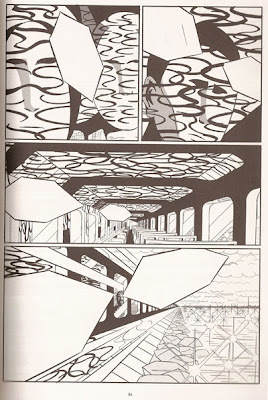 Again abstract shapes, in this case the arcs and circles that represent the smoke, dart across the panels and pages, filling up the space (like smoke) and, in the second page, closing in around the characters. 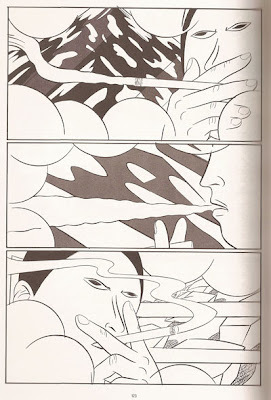 Yokoyama makes the smoking even more action filled by using the larger panel at the bottom of the first page to emphasize the movement of the exhaled smoke and by using strong horizontals on the second page that echo the speedlines that proliferate in the rest of the book. Yokohama is extremely skilled at pacing and composing his work. Despite the abstracted imagery and the imaginary landscapes, he always managed to convey a sense of space and movement. The panels read fast like the speed of the train. Everything is in high gear.